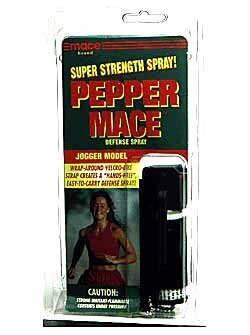 One of Mace's most popular defense sprays... Mace Triple Action combines the Maximum Strength Formula of OC Pepper and Invisible UV Marking Dye with the added power of CN Tear Gas that induces profuse tearing, shortness of breath, and disorients an attacker. 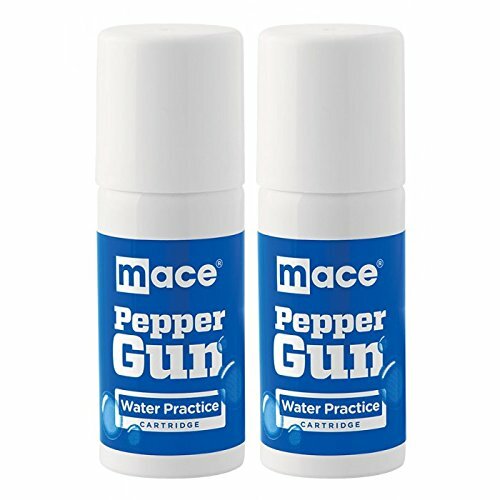 The advantage of Mace Triple Action is that you don't necessarily have to spray your attacker directly in the face, even if you miss and hit them in the chest, the tear gas will immediately start to affect them. 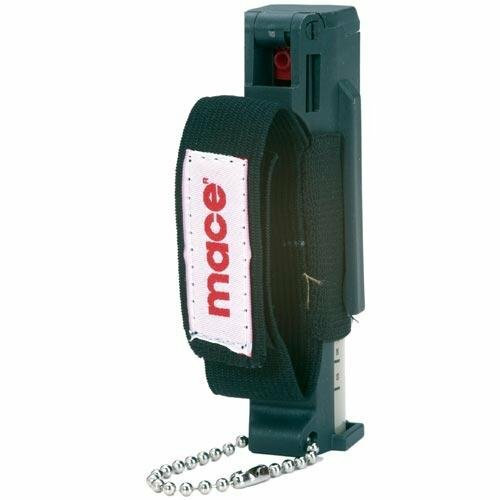 - This Triple Action Pocket model features the original Mace Flip & Grip design for safe and fumble-free defense. The flip-top safety cap prevents accidental discharge while the finger grip dispenser makes it easy to aim. Additionaly, its compact size and key chain make it ideal to keep with your keys or quickly tuck into a pocket or purse before going out. - You can safely DEFEND YOURSELF in a threatening situation with the extreme power of Triple Action Formula… 1% OC Pepper, invisible UV marking dye that can help police identify your attacker, and CN Tear Gas. Just spray and get away! SAFETY ISN'T EXPENSIVE, IT'S PRICELESS! Pepper Spray Etc. Store's main product line is College Safety Bundles. These can be used for a single student or for students to save and share. Either way, they are a great value! They are carefully thought out and each one offers more than one form of personal protection. We research each product to make sure they are high quality. Then we put together bundles that make good safety sense to college students. We will not sell anything we wouldn't personally feel safe using. This process takes time, effort and careful thought. Last, but not least, we try our hardest to keep the price point affordable for our customers. Thanks for checking out our products! 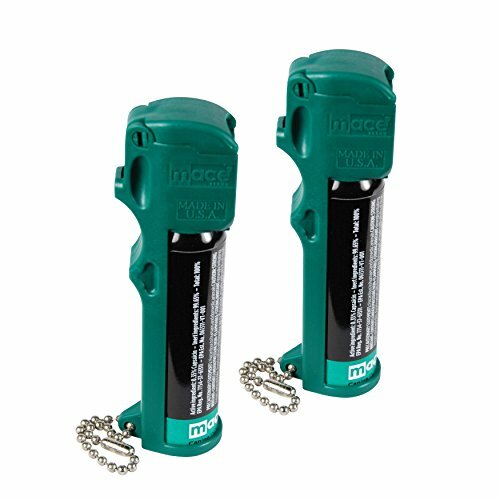 "Stay Protected While Staying Active With the Guard Dog Instafire pepper spray, you can feel confident and protected when out running alone, knowing that you’re ready to disarm any potential assailant in seconds. Designed specifically for runners, joggers, walkers and others engaging in outdoor activities, a breathable, comfortable, lightweight sleeve conceals a can of concentrated pepper spray right in the palm of your hand. Your thumb will be just a hair away from triggering the easy to open twist top. 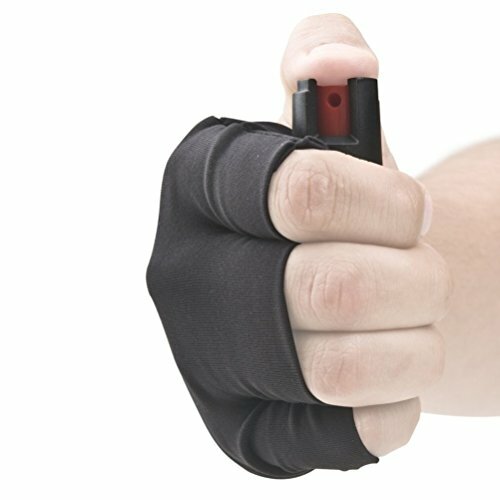 It’s the quickest, most accessible mini pepper spray on the market, all in a sweat-proof sleeve. The Hottest Spray on the Market At 18% concentration, Guard Dog’s InstaFire is the hottest “burn” available. Also in the formula is a special ultraviolet dye that is invisible to the eye but can’t be washed off, assisting law enforcement professionals in identifying an assailant after an attack. With a firing range of up to 12 feet and enough hot pepper spray for multiple shots, the InstaFire concealed pepper spray is your best defense on the go. Free Pepper Spray for Life Safe and laboratory tested, the top of the canister acts as a safety switch to prevent accidental discharge, but activation is easy with one quick thumb motion. In the event of use, Guard Dog’s industry-exclusive Protected 4 Life Program will provide you with free lifetime pepper spray replacement, so you will always be prepared. Guard Dog InstaFire Runners Pepper Spray Features: Unique activewear design Breathable, lightweight sleeve 18% OC red pepper spray 12 foot range Safety top Free pepper spray replacement Made and tested in the USA Safety is no accident. Buy your InstaFire Pepper Spray today!" 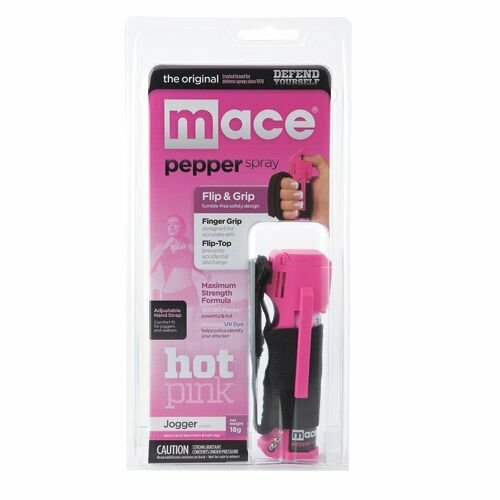 The adjustable hand strap puts police strength protection at your finger tips and is by far the easiest pepper spray to carry and use while running. Weighs 0. 75 ounces, 22 grams, 23. 7 ml and contains approximately 35 bursts. Has a powerful stream spray pattern and sprays up to 10 feet with the eyes as the point of aim. Spray pattern advantage is that it decreases wind blow-back. It has reinforced safety to prevent accidental discharge. Expiration Date: 4 years from date of manufacture. ***PLEASE READ*** THIS PRODUCT CANNOT BE SHIPPED TO NEW YORK. DO NOT ORDER IF YOUR SHIPPING ADDRESS IS LOCATED IN A RESTRICTED STATE! Discover the Personal Safety Corporation Difference...Quality, Savings and Service! It is all about balancing quality and price with customer service excellence. Personal Safety Corporation has been manufacturing the highest quality pepper spray since 1991. Quality is the #1 priority at Personal Safety Corporation. We are the originators of the 3-in-1 pepper spray formula. 3-in-1 is a registered trademark owned by PSC. We are the only manufacturer marketing a unique 4-in-1 pepper spray formula. Personal Safety Corporation also has the only safest-to-use leatherette finger grip holster in the industry. The quality of our products is unparalleled in the marketplace. For your safety and peace-of-mind we know that quality can never be compromised. All pepper sprays carry a 4-year guarantee. 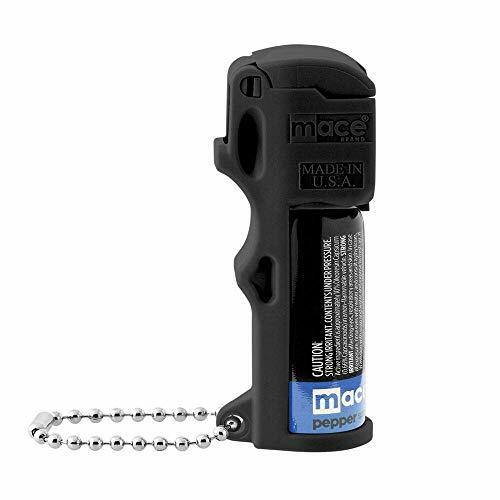 The dog pepper spray unit features flip top safety cap, finger-grip dispenser and key chain. Contains 10 short bursts that spray up to 10 feet. EFFECTS: Upon direct contact with eyes, respiratory system and mucous membranes, the ingredients in the pepper spray will cause eyes to slam shut, coughing, and an intense burning sensation to the skin. Symptoms should disappear in about 45 minutes. SAFETY: Keep out of reach of children. Follow the included first-aid instructions if the pepper spray comes into contact with your skin. Each Pepper Spray is under pressure. Do not puncture or incinerate the Insert. 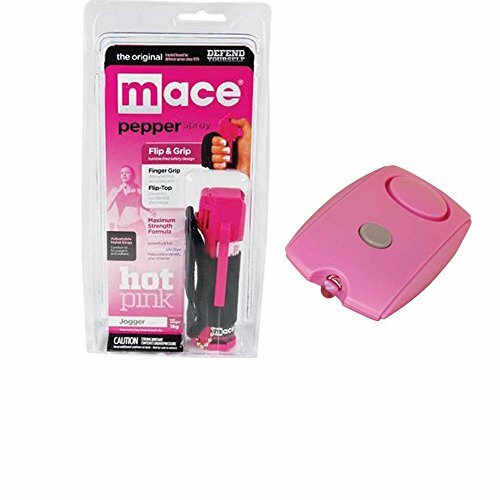 STORAGE: Store your Pepper Spray in cool dry area away from heat, flame or strong light. Use with adequate ventilation. Do not store it in an environment where the temperature may exceed 120 degrees F (50 degrees C).such as an enclosed vehicle. The Pepper Spray cartridge may leak from over pressurization and fail to function properly. Do not store unit in a cold environment under 32 degrees F (0 degrees C). This may cause depressurization and the loss of effective range. EXPIRATION: Pepper spray has a shelf life of 4 years from date of manufacture. Each pepper spray has an expiration date marked on the packaging. After this date, the pepper spray cartridge should be disposed of in accordance with the environmental regulations in your area. The cartridge can then be replaced by a new refill. 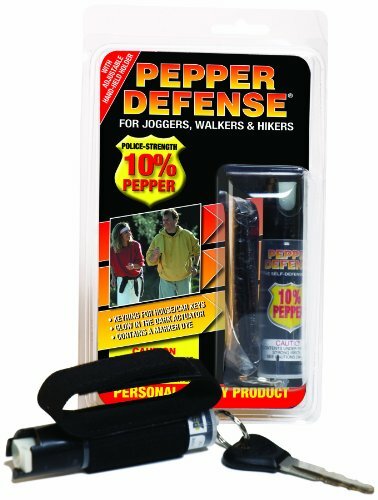 Perfect for anyone exercising outdoors, this Runner Pepper Spray with Adjustable Hand Strap offers police-strength protection at your fingertips on the go. 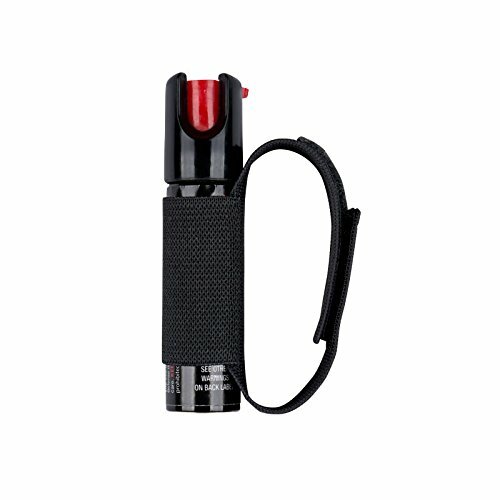 This athletic pepper spray contains 35 bursts for protection against multiple threats. It provides protection at a safe distance with its impressive 10-feet (3M) range in a powerful stream delivery to reduce wind blowback. 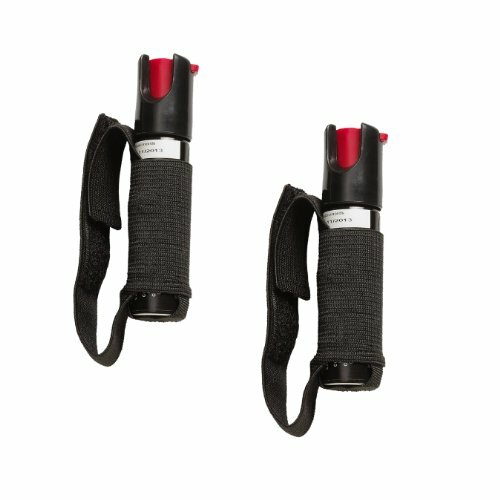 Small yet powerful, this Runner Pepper Spray with Adjustable Hand Strap is brought to you by the #1 brand trusted by police and consumers worldwide. Providing the world’s most reliable protection, our maximum strength pepper spray is backed by our exclusive in-house high performance liquid chromatography (HPLC) laboratory, which eliminates the 30% heat failure rate experienced with other brands (Source: University of Utah). This technology is the only way to ensure there are no pepper spray failures on the basis of heat inconsistency. Our HPLC technology is the industry’s #1 advantage – and it’s exclusive to SABRE. Your Runner Pepper Spray will contain maximum stopping power when you need it most. Protect yourself today! Pre-filled replacement cartridges are easy, quick, and safe to reload. Sold in convenient 2-Packs. Pepper Spray Pro from IWS for Protecting Yourself ! The Secret Of Protecting Yourself - Our product sprays a constant stream from any angle! - The effect of the product is immediate! - This product can be always carried! - Compact design and Key rings - You can conveniently keep the pro pepper spray ready! - It is an excellent best gift for precious acquaintances, gifts, present, presents, giving for christmas, thanksgiving, holiday. Introducing Your Very Own Pro Pepper Spray to the Rescue! - Product Name : Pro - The number of Spray : 30times - Spray Method : Nozzle Pump Spray - Size : Thickness 1.5cm, Length 12cm - Spray Distance : More than 2.5m ~ 3.5m - Material : Aluminum HOW TO USE - Remove the nozzle cap and spray toward the face of criminal by pushing it few times. - After use, please wipe the liquid around nozzle and close it by the cap for keeping. - The nozzle cap is separated by pulling it. - Spray few times toward the face of criminal. Quality Premium Products We Cannot Guarantee this Special Pricing, So Be Sure to Click Buy Now! SAFETY ISN'T EXPENSIVE, IT'S PRICELESS! LEGAL RESTRICTIONS: WE CANNOT LEGALLY SHIP SABRE PEPPER SPRAY TO NY, MA, WI, DC, AK AND HI. WE DO NOT SHIP OUT OF THE US.